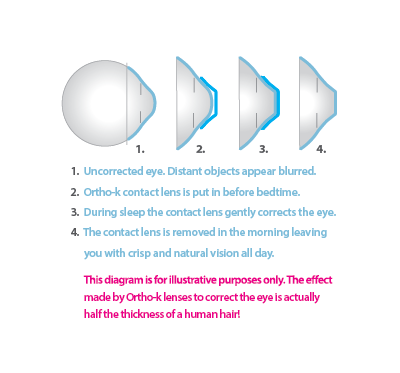 Orthokeratology (Ortho-k) lenses correct your vision while you sleep. Simply insert your Ortho-k lenses in before bedtime and remove them in the morning to wake up to clear, sharp, natural vision. Orthokeratology lenses are suitable for people suffering from myopia (short-sightedness) and will allow them to enjoy a life without lenses or spectacles during the day, whilst enjoying clear, natural, corrected vision. Ortho-k is available for patients with a Spherical spectacle prescription of up to -5.00D and Astigmatism of up to -2.50D. Ortho-k is fantastic for short sighted children, giving them the freedom to enjoy a life without the limitations of spectacles or daily wear contact lenses. associated problems, such as glaucoma, in adulthood. light that reaches the peripheral retina. The effect is not guaranteed, as results vary for individual children, but it has never been shown to make children more short-sighted. For more information about myopia control visit www.myopiaprevention.org. With Orthokeratology all lens wear is done overnight so the lenses are not worn out of the house, which means less worry about lost lenses or spectacles! Also, daytime is free of spectacles and lens wear so children can take part in all activities and sports without having to worry about their vision. Treatment plans include consultations, all Ortho-k lenses and cleaning solutions as well as replacements for broken or lost lenses. Plans start from £39 per month and there is a one-off consultation fee of £50. Call us on 020 8689 0011 for more information.